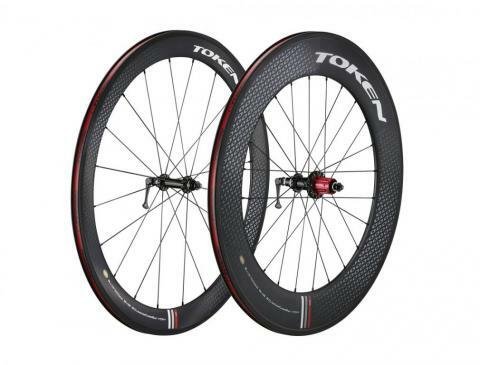 We combined our 55mm C55 clincher up front and 90mm C90 clincher at the rear to give you the best combo available for a wide range of time trial events. The 55mm aero profile up front gies you a good balance between stability and aerodynamics while the 90mm in the back is the next best thing to a full disc wheel. Both wheels remain nicely under control, even in crosswinds. Both wheels are equipped with Anti-Vibration Technology which cuts down on vibrations from the road surface as well as giving the wheel extra strength. TGz epoxy and our specially designed brake pads for carbon rims ensure that extreme temeperatures created during braking dissipate quickly preventing any damage to the rim. Finally, TBT bearing supply minimal rolling resistance making this wheelset the perfect choice for those athletes going against the clock.